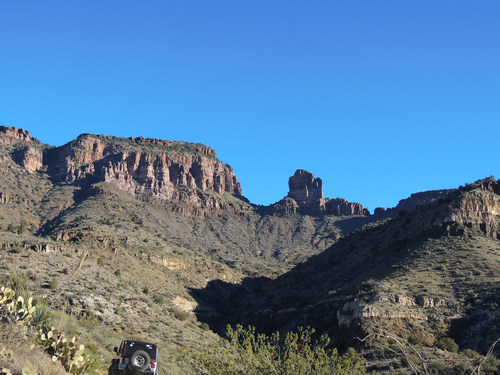 A very scenic and (usually) easy trip from US 60 north of Globe down Salt River Canyon and through very beautiful remote country to Cherry Creek and Young Road. 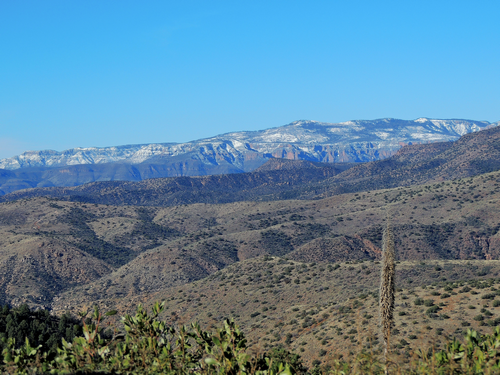 Most of this trail is on the Fort Apache Indian Reservation, home to the White Mountain Apache Tribe. 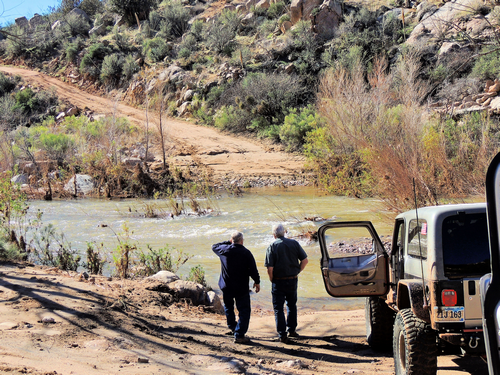 A permit is required for all recreational activities such as taking this trip. The permit could be purchased online when we did the trip in 2017, but that does not seem to be available as of Dec, 2018. We do not know how to obtain a permit, or even if it is still available to the public. 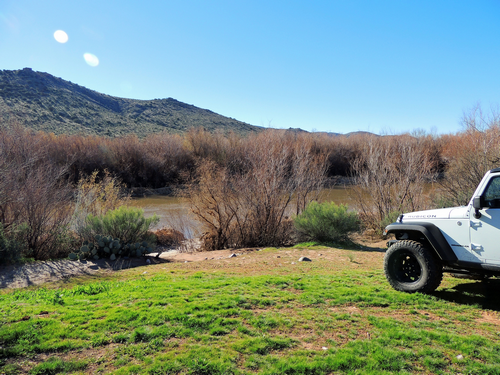 ​The Salt River begins in eastern Arizona where the Black and White rivers meet. The entire watershed, which comes out of the White Mountains, is 13,000 square miles, fed by snowmelt, rain and mountain streams. The river itself is about 200 miles long. 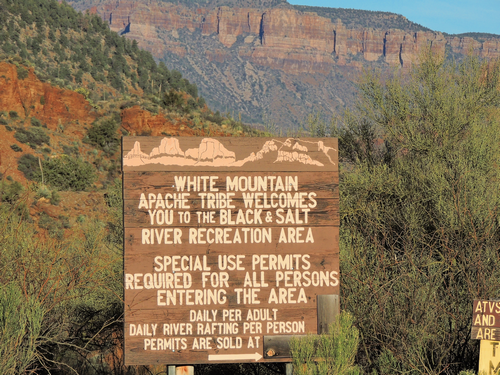 Just below the Black-White confluence are salt banks, which raise the salinity of the water, said Ileen Snoddy, coordinator of heritage for Salt River Project. 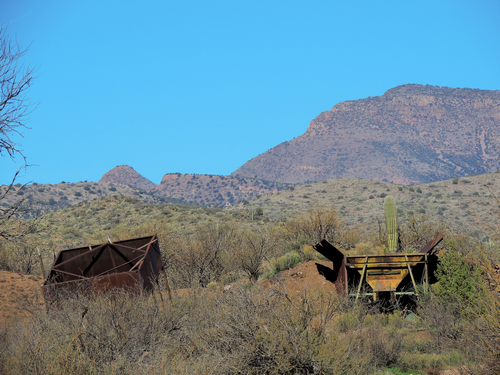 King Woolsey, a rancher, prospector and guide who lived in Arizona during pioneer times, thought the banks might prove useful as a salt mine. “He had seen the salt banks, and he tried to mine them for table salts,” Snoddy said. At the turn of the 20th century, salt was important. In addition to being used at the table, it was used to cure meat. Woolsey was never able to turn a profit from the mine, though, because the salt was mixed in with a lot of other elements and was difficult to extract. This trail can be driven in either direction but we ran it east to west. 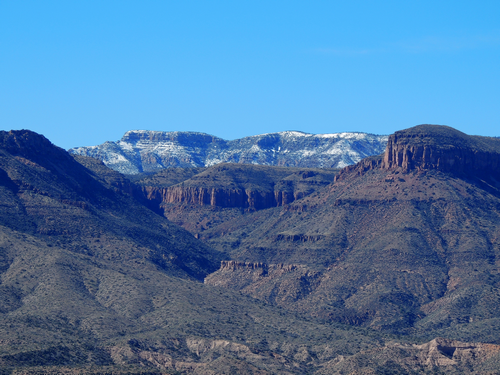 Perhaps a bit more scenic in this direction because the Sierra Ancha Mountains are frequently visible in the distance. 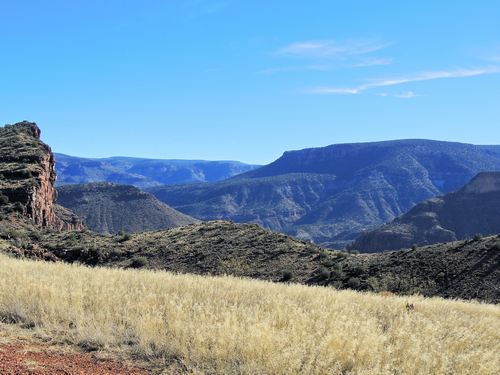 The road follows close to the river for a few miles then climbs into higher country north of the river. 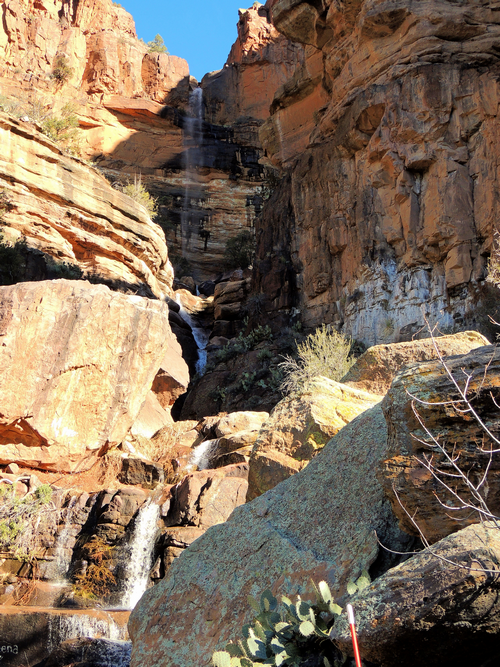 The first photo on this page shows a waterfall above the road in Rock Canyon. This photo shows a pool below the road. This amount of water will only exist after a heavy rain. It is hard to believe how high the water is during these deluges. Look how high the water has scoured the rocks in this creek. 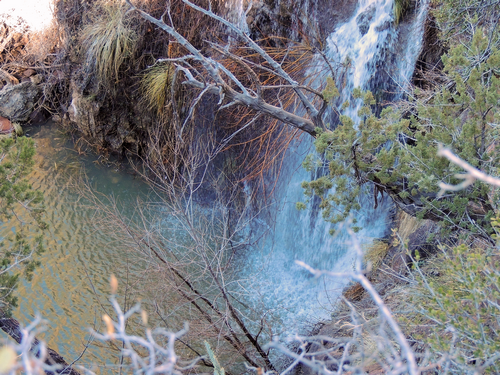 There is a side spur to an overlook 2 - 3 miles west of Rock Canyon waterfall. It is worth the short diversion. 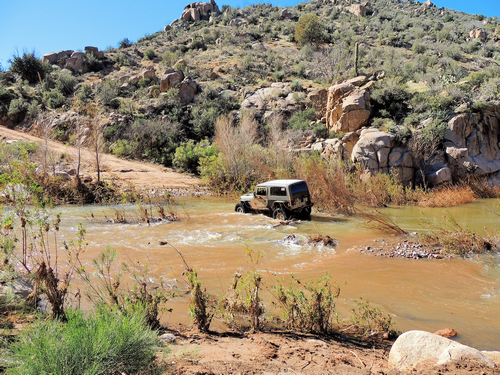 There are several water crossings on this trip. Most are no problem in normal weather with little rain. 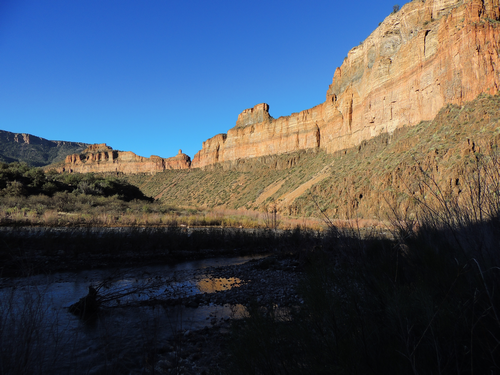 Canyon Creek is the largest drainage and can be impassible after a heavy rain. We have only done this trip one time so do not know what it is like in normal weather, but we certainly know what it is like a week after a major and widespread rainfall. We looked the creek over pretty hard, thought about it during lunch then decided we could cross it if we paid attention and did it right. 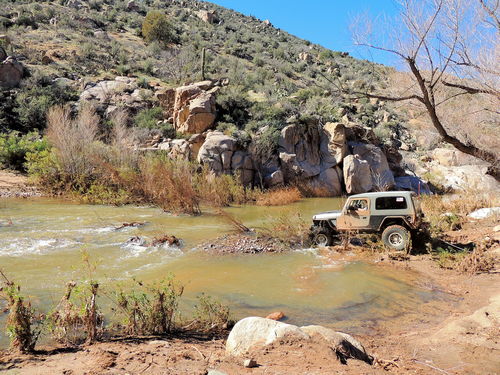 The idea was to have the first Jeep attached to a winch line so he could be winched backward if he got in trouble. Things went smoothly with no hidden deep holes. Once all were across without incident we reeled in the winches and headed on. The trail headed back into higher ground then dropped down to the Salt River once again. 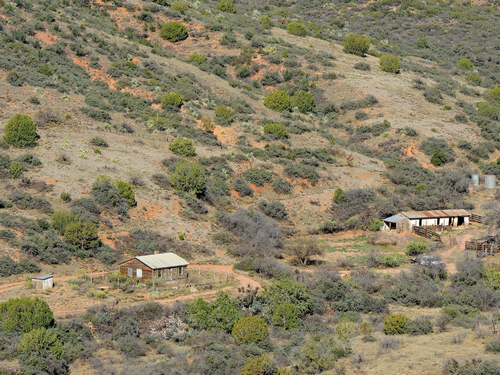 The trail reached high ground and split into an east and a west leg near Medicine Ranch. Road signs and markers seem to indicate that the west leg is the main route, but we believe the east leg is more scenic. The east leg stays on ridges with nice views, while the west leg spends a lot of time in valleys with much less to see. Both legs are included in the gpx track file. 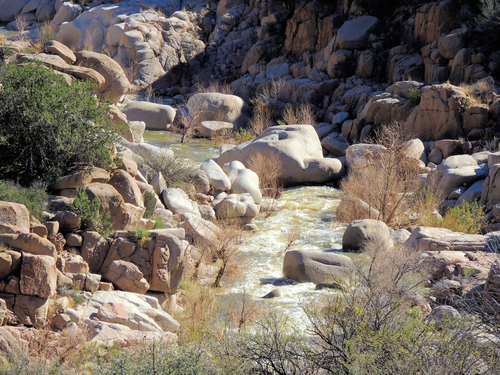 Medicine Creek flows across both legs, and also erodes both legs. 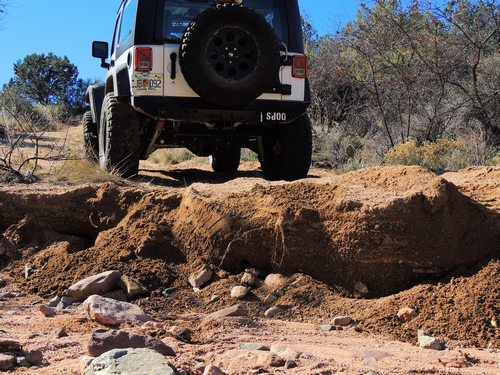 We found the east leg crossing somewhat easier, but that might be because of the recent rain. 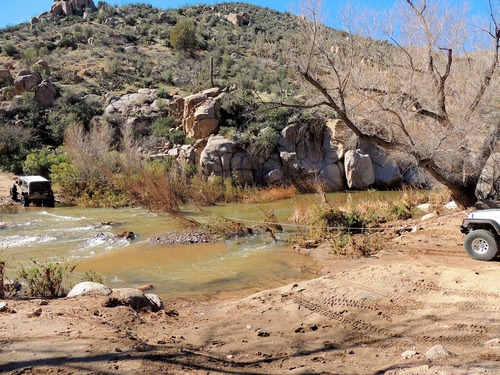 The trail reaches the Salt River at Gleason Flat. The only thing of interest seems to be some abandoned equipment. 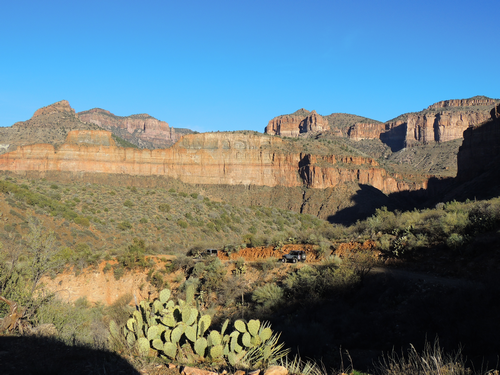 The Sierra Ancha Mountains are impressive as you approach the west end of the trail. 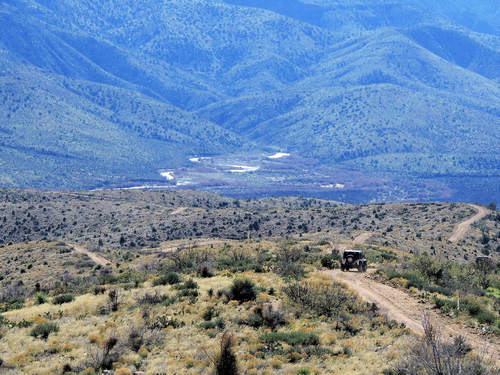 If you are lucky you might see some of the Apache horses. I have rated this trail at 2.0 because that is what I THINK it will be most of the time. 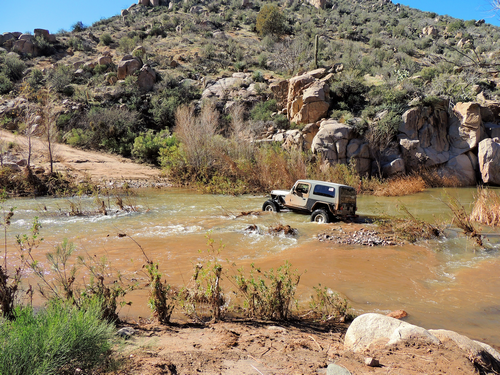 The only areas with any difficulty are the water crossings. 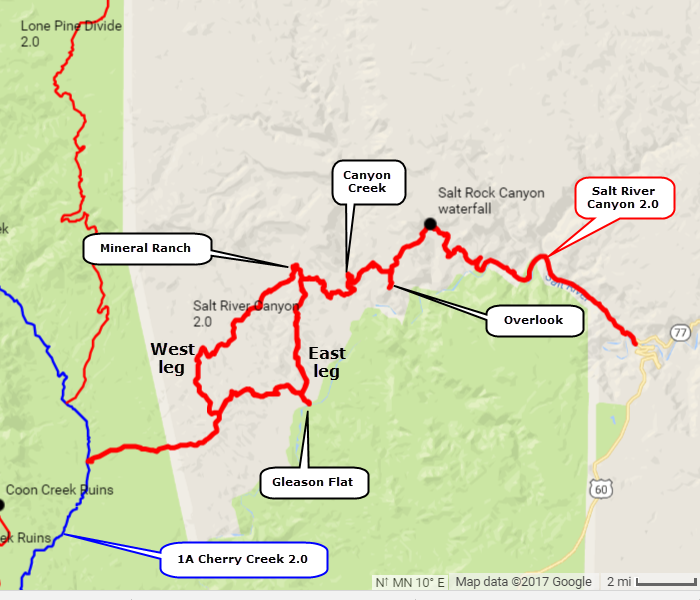 We did this round trip from Gold Canyon in 9.5 hours while stopping for lunch, fording Canyon Creek and a taking a few other short breaks.